AllegroMedical.com presents The iHealth Wireless Arm Blood Pressure Monitor. 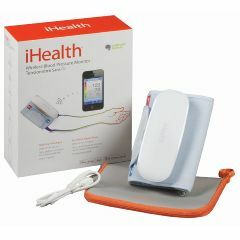 The iHealth Wireless Blood Pressure Monitor makes it easy to check your own blood pressure, anytime and anywhere. Using the free iHealth mobile app on your iPad, iPhone, or iPod touch, measure and track your systolic/diastolic numbers, heart rate, pulse wave, and measurement time. Then share your results instantly. Email Your Results Directly To The App! Measure and track your systolic/diastolic numbers, heart rate, pulse wave, and measurement time. Keep track of physical activities and daily diet as part of your overall health regimen. Create visually dynamic charts to track your progress. Compare results against your historical averages, as well as World Health Organization (WHO) classifications. Share results instantly with friends, family, or your doctor. Easy to track your blood . fast - simple - doesnt crush arm. fast. doesnt crush like omron. recently started low dose bp med and want to check progress. accurate. convenient - can use anywhere (not like the Omron this replaces). nice graphics. use with any model ios 7 device. email results to my MD. retain other info such as weight and exercise.